I use my phone as my alarm to wake up in the morning. Usually, as soon as I turn off my alarm, I check my emails while still in bed. It helps me wake up to sort through and clean out any junk mail that may have come in through the night. This morning, I woke to find a nice email from a man named Carlos. Carlos wrote to me about a YouTube video recipe I had posted some time ago. He had tried it and emailed me to say that it was very good. What a great way to start my morning! I wasn't sure if anyone really watched those video blog recipes so I wasn't very motivated to make another. It is a goal, however, on my 25 by 25 list to make 4 more videos before February. I think I'll start working on another this weekend! Last night, I went to the gym with my mom. I love that lady so much. She really loves to support me and here I am wanting to do the same for her! I went over to her house right after work and told her I was on my way to the gym. I like to invite her because having a gym buddy makes the time fly and its nice to know that she is getting some time to herself to exercise. So, even though she had plans to go shopping when I had stopped by, she came with me right away. I walked on the treadmill for 20 minutes then used the elliptical for 10 minutes. When I got home, I felt like I needed to stretch. I decided to do 30 minutes of Wii Fit Yoga and felt much better afterwards. 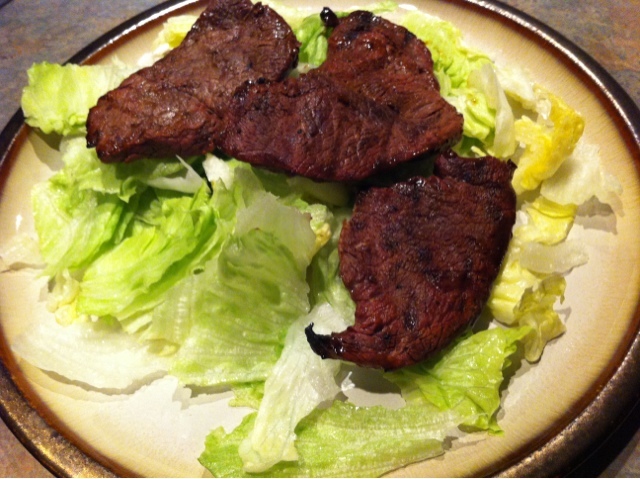 For dinner, I made myself a salad with leftover deer steak. It worked out well because it was a quick meal and we didn't waste any deer meat! I saw a comment yesterday from a reader who likes deer meat but also loves moose meat. I've never thought to try moose meat before but I'm sure it's great! I'm curious, have you ever tried moose or deer meat? Do you eat any other type of game this time of year? I've only had deer jerky and love it. My husband absolutely loves deer chili though! I imagine if moose was available for hunting where I live we would eat moose meat, but we are deer meat people in my household. We eat all kinds of deer meat... deer roasts, deer steaks, deer loins, deer jerky and deer sausage. I am very fortunate to have a dad who hunts and gives me some deer meat quite often, as well as a brother that loves to hunt but his family doesnt eat deer meat so that also helps me stock my freezer! Deer meat is so lean and much healthier than the processed hamburger products you get in the stores. I would suggest if you do deer hamburger to cut it half and half with real burger because deer is so lean that it is dry if you dont mix it togther! I live in Montana so there is a lot of interesting meat floating around. I don't believe I've had moose but now I want to search for some and try it! But I've had elk which is great. I also like bison (it's like super lean ground beef) and antelope sausage. All of these I like better than deer. Never been a fan of that. It's good to try different protines. Thanks for sharing. (Glad you're feeling better too).